William M Dean - Slices of Laugh: What's So Great About Retweet Trains? 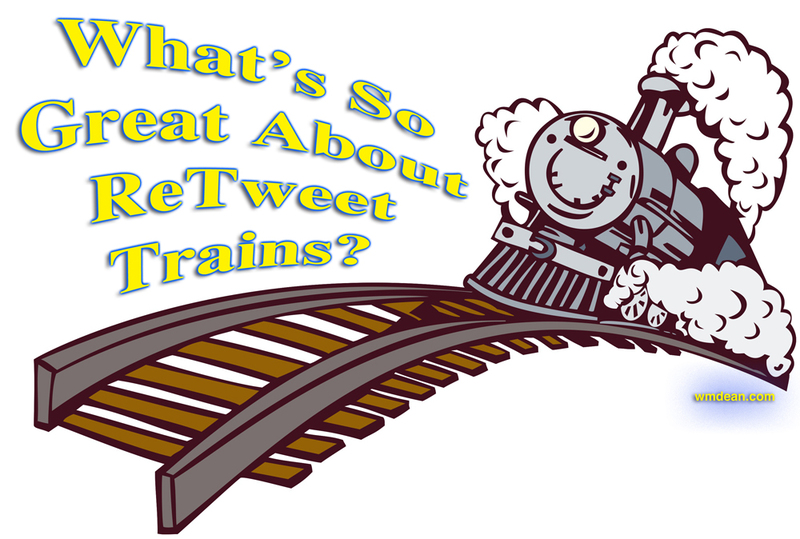 What's So Great About Retweet Trains? The other day, I climbed aboard a ReTweet Train, for a brief ride. In case you've never heard of ReTweet Trains, they are, basically, Twitter accounts where every follower is committed to (a) ReTweeting each other, and (b) following everyone who follows them. 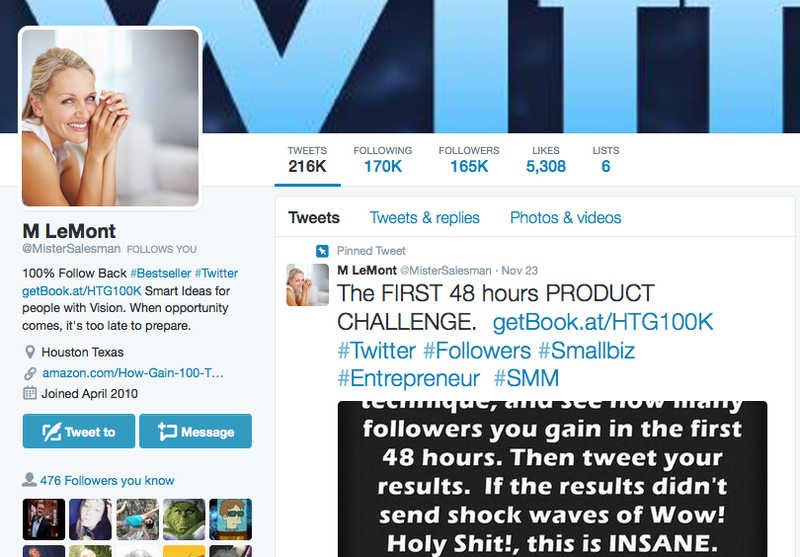 I started by looking over a ReTweet Train that was recommended to me, through a friend: The Twitter page of M LeMont (https://twitter.com/MisterSalesman) which is largely a long repetitive list of ads about his ReTweet Train. I began very noncommittally by ReTweeting one of the ads. Within seconds, new followers and ReTweets began to accumulate on my account. I was seriously amazed to see 20... 30... then 40 new followers and 50 ReTweets, all in the space of 10 minutes. The number of clicks on my blog soared, as well. I got an extra 200 hits, within the first hour. In the end, however, it was against my policy to follow people who aren't providing interesting content, and so I only followed one person from the train. Consequently, all the followers I had gained, unfollowed me within 24 hours, as is part of the ReTweet Train code of conduct. 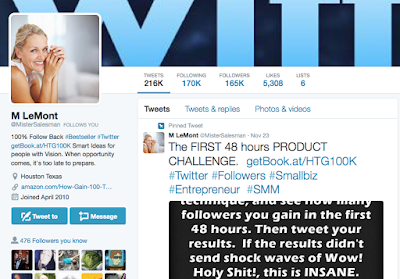 A ReTweet Train is a sure-fire way to gain Twitter followers. 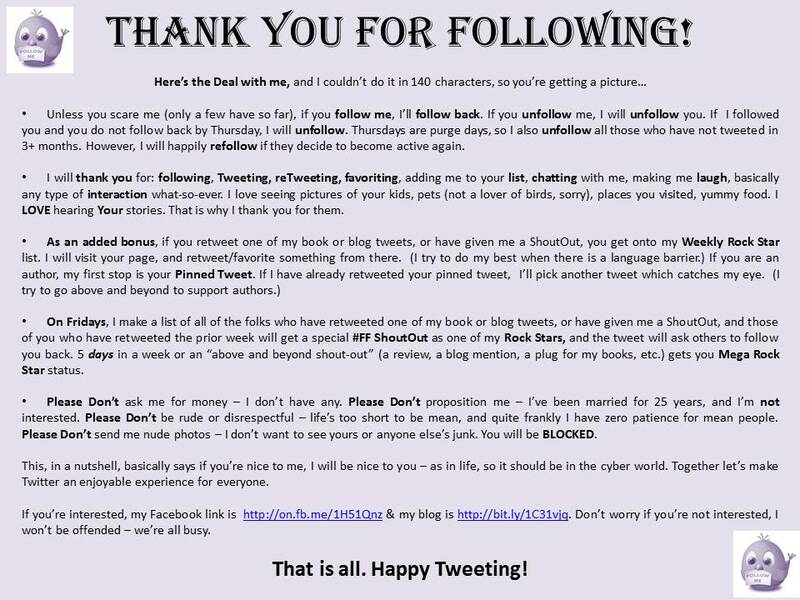 If you follow the advice of @MisterSalesman, for instance, and put in the hours of hard work, you will probably reach the target of 100,000 followers, within a year. The basic theory is that with numbers that large, it doesn't matter whether or not they are your target group, you will still gain genuine followers—it's a shotgun approach. It makes some sense as almost every account on Twitter habitually trades a follow for a follow. This means that mixed in with all those professional number-generating spammers are millions of ordinary people, and if your material gets spammed to millions, then by happenstance and good timing, several hundred might actually see your stuff. As almost everyone's Twitter feed is filled with follow-for-follow spam, this type of numbers strategy might well be the only way to get significant exposure, through Twitter. My recent experience seems to have proven this shotgun approach valid. I ended up with no more Twitter followers than I had before, but a week later, my blog is still getting 50-80 more hits than before this experiment. As I'm not honouring the ReTweet Train code of following everyone and ReTweeting a whole bunch of crap, the number of hits on my blog may ebb—though one week later, it hasn't. Nevertheless, I am impressed: This is, possibly, the first thing I've seen in social media that had an immediate and measurable effect. I'd be 100% on board, if there were more interesting things posted on the ReTweet Train that I could ReTweet, rather than just ads for the ReTweet Train, itself. Of course, this strategy flies in the face of Twitter advice I published only a couple of weeks ago (see My 1st Year in Social Media), but that advice was for building a strong Twitter account, assuming that Twitter is your main platform. This shotgun approach is more suited to using Twitter solely to promote another site. If you adopt this strategy, your main Twitter feed will soon be polluted with thousands of ReTweeted ads and junk, so you'll have to start using Twitter's List feature to create separate, more useful streams for yourself. If you want a more pristine Twitter feed for others to view, you might have to create a second one, to which you post more selectively. My next excursion on a ReTweet Train will be a more ambitious outing. After all, my focus is my blog and from there, my book. I only use Twitter as a traffic-generating tool. So, why worry about the virtual pollution that tool creates? If that's the way this particular tool is most effectively wielded, then perhaps it's silly to be using it any other way. I'm still reluctant to participate in generating numbers using endless cycles of spam, but my feelings are not really a valid reason not to do it. And, if it produces results, then I'm sure that I'll quickly warm to the idea. UPDATE: After a heated debate in my own mind, I've spent the last 5 days actively involved with the M LeMont ReTweet community (https://twitter.com/MisterSalesman) accepting followers in return for follows which has yielded a couple of unexpected results. Firstly, My blog hits immediately started growing. But the larger surprise for me was that during the initial follow-for-follow exchange between myself and other people, I have had some very nice exchanges and connected in a small way, with others who are all part of the same social-media experiment. Somehow—perhaps because all of us having laid our cards on the table about why we are following and ReTweeting—the initial contact is much more comfortable as people are more open to the approach and to conversation. Also, I eventually realized that M Lemont's page is not the place to find stuff to ReTweet. You are supposed to explore the pages of other ReTweeters who follow you. M Lemont is just a central hub to connect us all. I now check out each follower, I thank them for their follow with a ReTweetable picture and I ReTweet something of theirs. NOTE: This article has turned into what may appear to be a huge endorsement of M Lemont's Twitter page. I want to assure readers that I am in no way affiliated with M Lemont and am just reporting what actually happened to me. There are other ReTweet Train pages, this was just one recommended to me. If I seem enthusiastic, it's just because it seems to work. If it stops working, or I determine that there are negative consequences, I will update this post appropriately. Sincerely, William M. Dean. 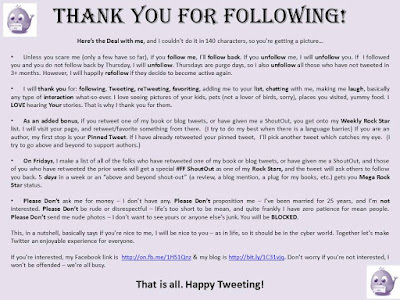 Bonus Twitter Tip: Thanking those who choose to follow you is an opportunity to make contact and get ReTweeted. 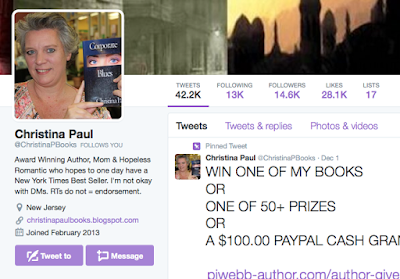 As part of my ReTweet Train experiment, I followed author, Christina Paul (https://twitter.com/ChristinaPBooks) and received this thank you, in return. I liked the earnestness of her reply, as well as the idea of including so much info in a picture. Also, I found her Twitter policies interesting. They might take a lot of time to implement, but would probably generate a lot of ReTweets of her material.